Have you ever worked with Adobe LiveCycle ES and got error codes like the following? Note that not all error codes are on this but it is a great start! Happy debugging. Free full day Flex/AIR/Flash Camp in Vancouver-Berlin! We just booked a room and can now confirm that there will be a full day of 100% free hands on training for RIA development in Vancouver, BC May 28 at Vancouver Harbor Centre. The day will run from 8:00 AM to 5:00 PM with a possible evening event with a live band. The venue will be the Fletcher Challenge Canada Theatre (room 1900) in Harbour Centre. While we have not yet confirmed all speakers, the lineup will likely include Peter Armstrong (Author - Flexible Rails, RoR and Flex guru), Andre Charland (CEO - Nitobi, PhoneGap), Doug Schmidt (Effective UI and Moose killing shovel wielding Ninja), Clive Goodinson (Pixton), Ross Ladell and others. For RIA development, this is the one chance in a year of seeing all the top Vancouver developers under one roof. Bring your laptops and code along! You'll likely leave with tons of new code samples and ideas. We want to make this a community driven event - if you want to present a code snippet, please email me! We'll try to make the afternoon presentations democratic. The day will be 100% community driven and hands on. Anyone is welcome to join. We have not yet set up a registration site but in the meantime, please email me dnickull at adobe dot com. There will also be a similar event in Berlin, Germany in June 2009 sometime between June 15-19 2009. Ich liebe Deutschland!! I have already booked my flight. 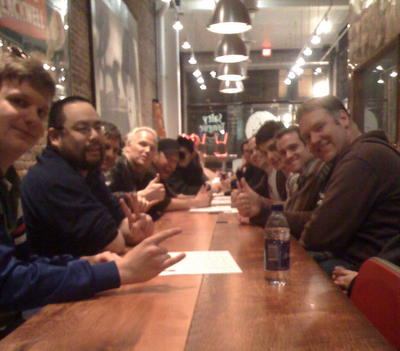 As for Vancouver, the Vancouver Flash/AIR/Flex User Group is simply one of the best groups ever. Here is a shot of me and my homies hanging out after last month's User Group meeting. We finally announced the MAX 2009 event schedule. Ted Patrick sent out the message this morning. "Despite the challenges presented by the economy this year, Adobe is excited to be moving forward with our largest designer/developer event Adobe MAX 2009. MAX will take place October 4-7, 2009 in Los Angeles and online. We will not hold a unique Europe event in 2009, however, we are actively exploring options to make the Los Angeles event more accessible for our worldwide community. MAX Europe has been a real success for Adobe and it is our intention to return to Europe in the future. Personally having been a part of every MAX Europe event, I know how important the event is to our global community. In order to make MAX a more global event, I want to encourage everyone, regardless of location, to participate in the "MAX Call for Sessions and Labs". We are actively working to bring Adobe MAX to a far larger audience online in 2009. In 2008, we recorded MAX sessions and published them on AdobeTV for everyone to view. To date, MAX session content has been viewed by over 250,000 users, 50 times larger than physical MAX attendance in 2008. This year will be taking the online experience to the next level." At the last three MAXs, I have given a talk on form design called "Forms Gone Wild". Despite the talk's title seemingly indicating that a bunch of forms went down to party in Florida for spring break, it does contain some great tips and thoughts for form designers. 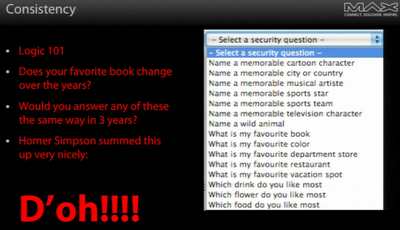 Every year I update this talk based on really bad forms. If you come across any bad forms that might be candidates for the talk in 2009, please send them to me at dnickull at adobe dot com. Fox news has sunk to a new low in disgraceful behavior. Canadian soldiers are dying in Afghanistan. Many other Canadians, including myself, are working on projects to help the US government. We are all making sacrifices to root out evil and terror and confront it. Our troops are getting the hardest tasks and holding their ground (as we did in WW1 and WW2). Last night Fox news crossed the line. The comments of Greg Gutfeld, host of "Red Eye with Greg Gutfeld," a round-table chat show that airs late night on weekdays on Fox News, have evoked outrage among the Canadian public. The message I am writing is don't mess with us. We are there to fight a war on terror. Fox news is now mocking our sacrifices? The majority of Canada *were* behind the US until this came out. Now the US needs to do something pretty fast about Fox. "Why don't we just invade this silly little country (Canada)"
These comments were made almost 7 days ago by Gutfeld. We are outraged!!! They have come to the top of the news when Canadians were showing respect to four soldiers recently killed in roadside bombs blasts in southern Afghanistan. Gutfeld better not come to Canada. I am now going to call my cable provider to make sure Fox is unbundled from my cable. Critical patch out - please use! Adobe recommends users of Adobe Reader and Acrobat 9 update to Adobe Reader 9.1 and Acrobat 9.1. Adobe recommends users of Acrobat 8 update to Acrobat 8.1.4, and users of Acrobat 7 update to Acrobat 7.1.1. For Adobe Reader users who can’t update to Adobe Reader 9.1, Adobe has provided the Adobe Reader 8.1.4 and Adobe Reader 7.1.1 updates. For more information, please refer to Security Bulletin APSB09-04. Adobe now plans to make available Adobe Reader 9.1 for Unix by March 24.